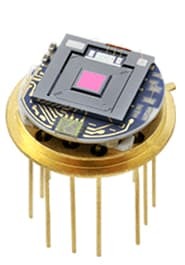 This unique new infrared detector design from the R&D lab at InfraTec was developed to allow scanning over a range of wavelengths by simply adjusting the control voltage. 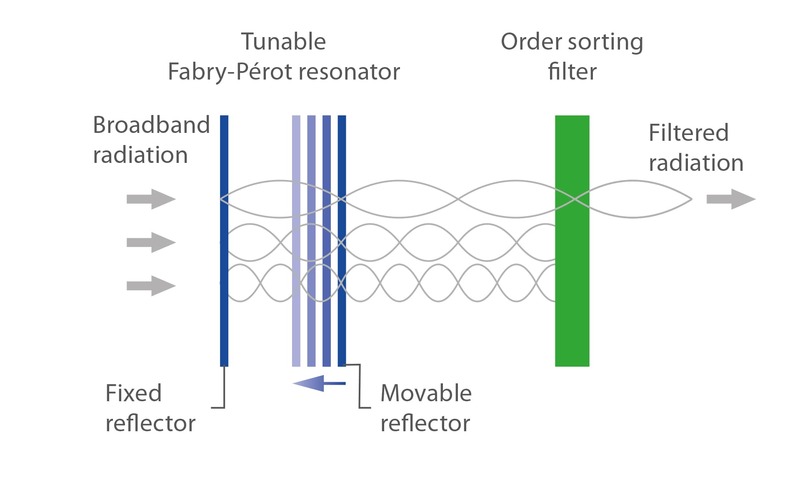 Instead of mounting filters to inspect specific areas of interest, the Fabry-Pérot filter control can be used to monitor a broad spectral region continuously. Different types with first order filters and wide tuning ranges are currently available. They span nearly the whole mid and long wave infrared range of about (3 ... 11) μm. Other ranges or customized designs may be possible on request. Devices with integrated ASIC can be operated in a control loop – in this type designation they are characterized by the letter "C". Position feedback of the reflector plates is given by capacitance measurement. This means the filter can be stabilized against external acceleration forces. Temperature drifts are automatically compensated by closed loop operation as well. The Fabry-Pérot filters (FPF) are integrated into TO8 housings together with a LiTaO3-based pyroelectric detector. 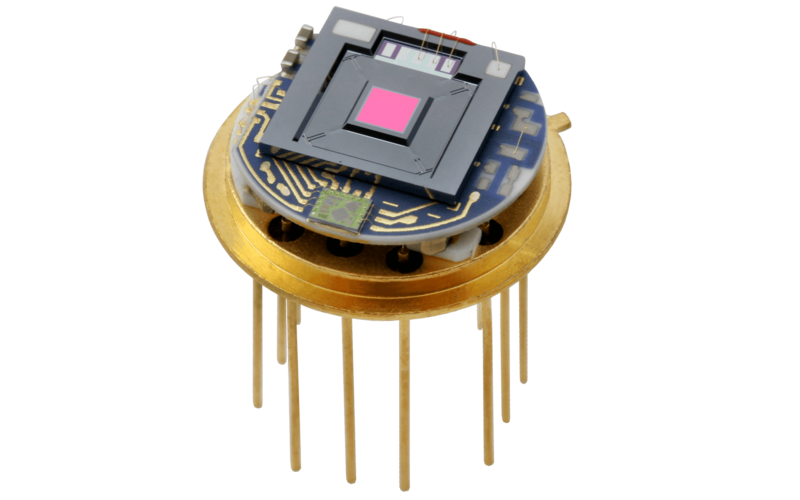 The detector is a state of the art thermally compensated current-mode type with an integrated op-amp. The element size of (2 × 2) mm2 matches the size of the filter aperture. The order sorting filter is integrated in the cap. Calibration data are stored in an EEPROM. A version with an integrated ASIC for position feedback of the moving mirror plates, is optionally available. The closed loop control greatly improves center wavelength (CWL) stability under the influence of changing gravity, e. g. by rotating the detectors inside a portable device. 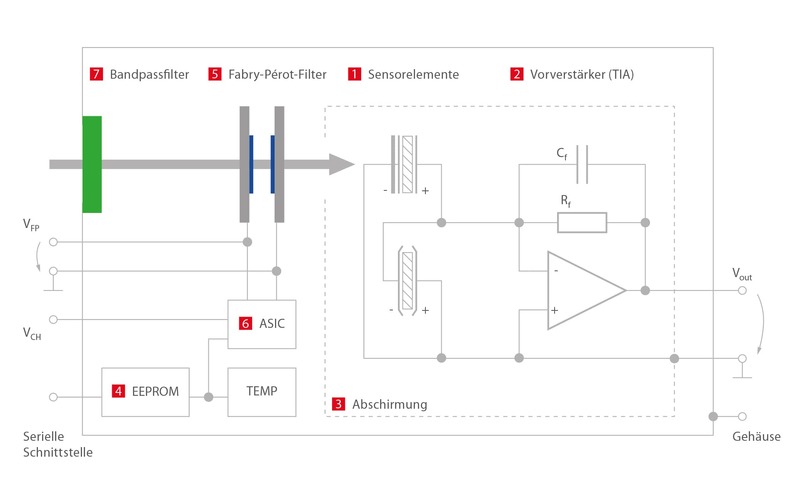 Get further information about pyroelectric detectors with spectrometer functionality from InfraTec. InfraTec’s tunable filter technology is based on a micromachined Fabry-Pérot interferometer (FPI), which is comprised of two flat and parallel reflector plates (Fig. 2). In simple terms, it acts as a half wave resonator, producing a series of transmittance peaks of successive interference orders (Fig. 3). 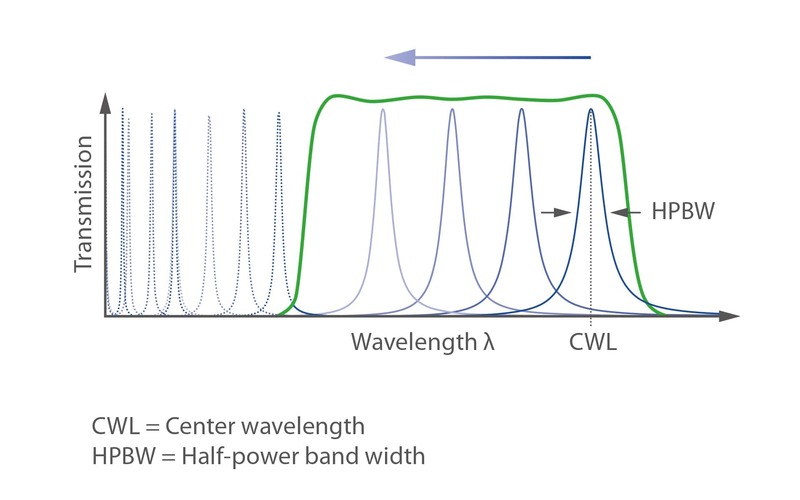 By changing the plate separation the peak positions and thus the center wavelength (CWL) can be tuned. An additional, in series with the Fabry-Perot filter (FPF) placed bandpass filter (fine filter) allows an unique narrowband filtering. 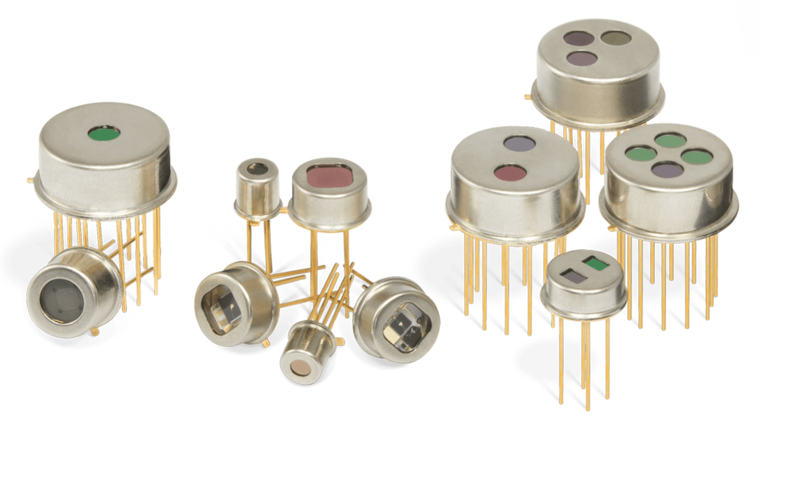 The kit supports customer needs for an initial test of FPI detectors without having to develop test circuitry or software themselves. It allows easy control of detector and IR source with customized software to analyze the detector signals. With the help of this kit a quick and easy configuration of a simple Fabry-Pérot spectrometer is possible. 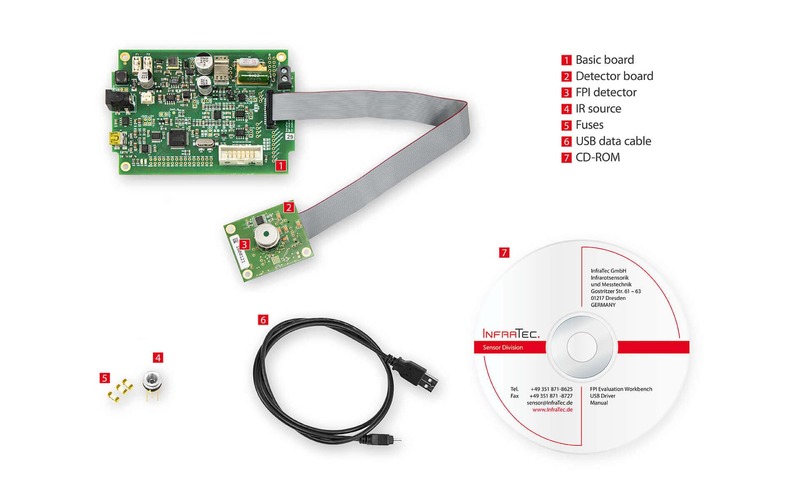 The Evaluation kit includes a basic board and a detector board with USB interface, USB cable, ribbon cable, CD-ROM with test and measurement software, USB driver, and a manual. The basic board is compatible to all FPI detectors and FPI detectors with ASIC control. A version of this kit with an IR source is also available upon request.